Instead of giving separate accounts of Legendre's and Jacobi's works introductory to the general treatment, I have produced their discoveries in the proper places in the text, and I believe that by this means confusion has been avoided which otherwise might be experienced by students who are reading the subject for the first time. The emphasis lies entirely on the theoretical side: I have endeavored to give clear definitions of the fundamental concepts, sharp formulations of the problems, and rigorous demonstrations. Difficult points have received special attention. These notes describe the Aubry-Mather-Theory within the calculus of variations. The text consists of the original lectures of Juergen Moser and a bibliographic appendix with comments on the current state of the art in this field of interest. 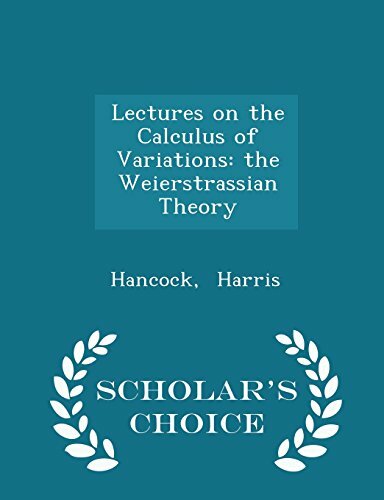 These notes are intended as a straightforward introduction to the calculus of variations which can serve as a textbook for undergraduate and beginning graduate students. The text covers functions of n variables and ordinary differential equations. The book traces the progress of the Calculus of Variations during the nineteenth century: Lagrange and and Lacroix, Dirksen and Ohm, Gauss, Poisson, Ostrogradsky, Delaunay, Sarrus, Cauchy, Legendre, Brunacci, and Jacobi.